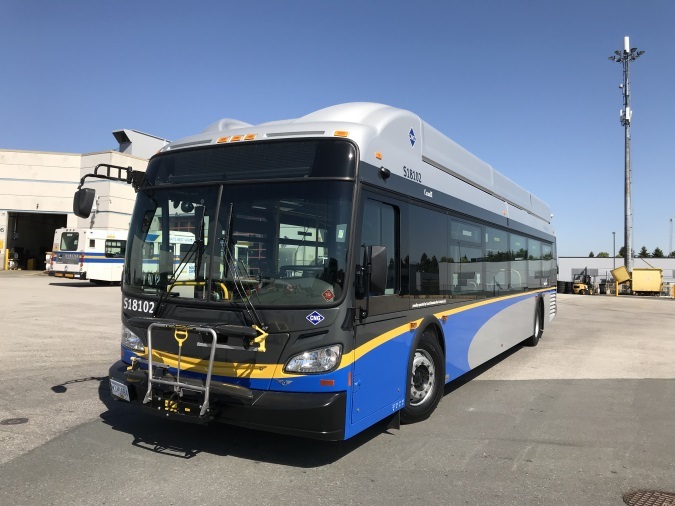 Clean energy initiatives and safety are two high priorities at TransLink, which is why we’re excited to be adding 106 new Compressed Natural Gas (CNG) buses to the fleet at the recently upgraded Surrey Transit Centre. All 106 of these new buses will also be equipped with bus safety barriers to help keep our operators, and passengers safe. Transit riders can expect to see these new CNG buses in operation in Surrey starting this week, with full roll out of all remaining new clean energy buses by the end of 2018. One of the compressed natural gas buses in the Coast Mountain Bus Company fleet. TransLink is a part of the International Bus Benchmarking Group (IBBG) that measures bus performance from larger transit agencies across the globe. Each year, we ask our riders to participate in a survey through IBBG that helps us look at best practices, customer satisfaction, performance measurements. Your feedback is extremely important so that we can use to make our bus service better than ever! Being a part of this group also gives members the unique opportunity to learn from other bus companies to improve performance. Coast Mountain Bus Company (CMBC, Vancouver). The survey will be available from April 24 until May 21, 2017. Check out a short interview with IBBG! For TransLink, safety is a top priority for all people travelling on transit, including our bus operators. Assaults on operators are unacceptable and can put the lives of our riders at risk. After a two-year process of piloting various barrier designs, assessing effectiveness, collecting user feedback and modifying designs, we are now ready to equip our buses with bus safety barriers. Safety barriers allow operators to do their job, getting you where you need to go efficiently and safely, while maintaining driving sightlines, communicating with riders and protecting themselves against attacks. All future orders of new 40′ and 60′ buses will come with safety barrier already installed. Buses will start arriving by early 2018. 208 air-conditioned New Flyer Excelsior buses will be retrofitted with safety barriers. Six trolley buses will be retrofitted as part of the expanded pilot program. Retrofit of 214 buses will be underway by the end of 2017 and completed within two years. Within 10 years, about 75 per cent of the fleet will have safety barriers installed. Sliding front portion allows easy customer communication and controls glare. Fixed solid portion means barrier prevents attacks from behind—even when the sliding portion is open. Offers protection from assaults including jumping assailants, thrown objects, climbing over and spitting. What does this mean for riders? Nothing changes! The bus barriers don’t affect your commute at all. You will still be able to talk to and communicate with your favourite bus operator! Want to know more? Check out the backgrounder! Have you spotted one of these new bus barriers on your route? 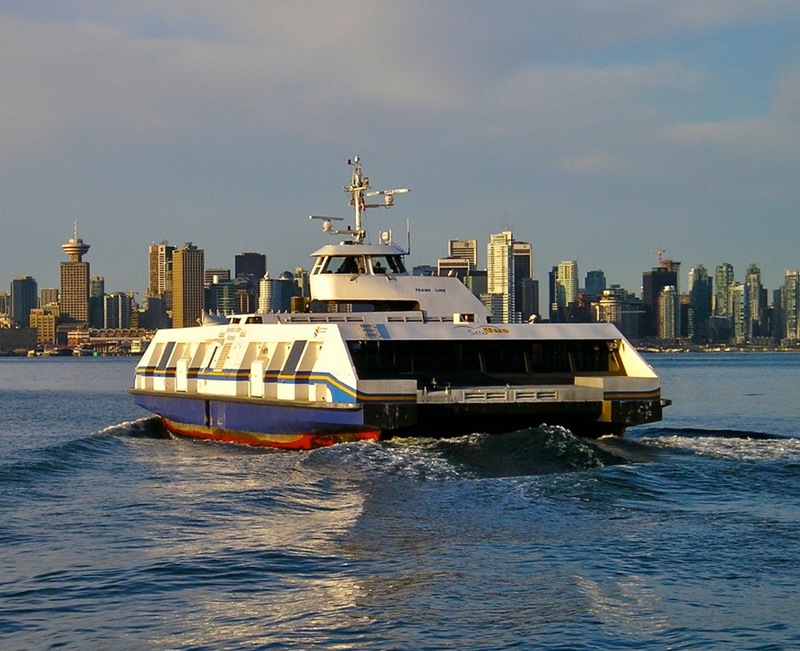 Tweet us @TransLink and let us know what you think! Today is World Water Day 2017! This annual event is about taking action to tackle the world’s water crisis and this year’s theme is wastewater (aka as the water that runs down the drain and we aren’t actively using) and how we can utilize this resource. At CMBC, water conservation and using wastewater is an important part of our operations. Starting in 2016, CMBC has committed to reduce bus washing by at least 50% each summer between June and the end of September! Plus! Anytime Metro Vancouver introduces Stage 2 water restrictions, CMBC will voluntary stop all bus washing, except in special circumstances. These changes yield BIG water savings! 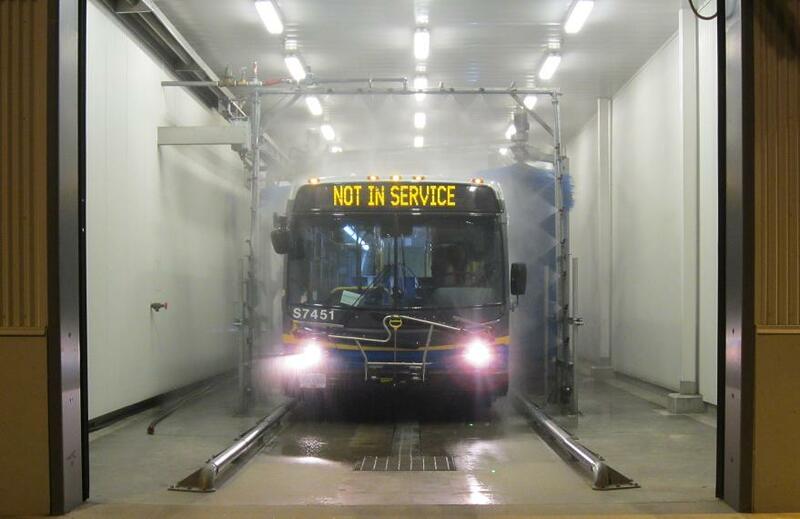 At Burnaby Transit Centre alone, suspending bus washing translates to saving up to 35,000 litres of water each day! At all transit centres, we use recycled or “wastewater” for the wash and fresh water is used only for the final rinse. These water recycling systems reduce the amount of water required to wash each bus by about 75 per cent! Want to learn more about World Water Day? Visit WorldWaterDay.org or join the movement on Facebook. 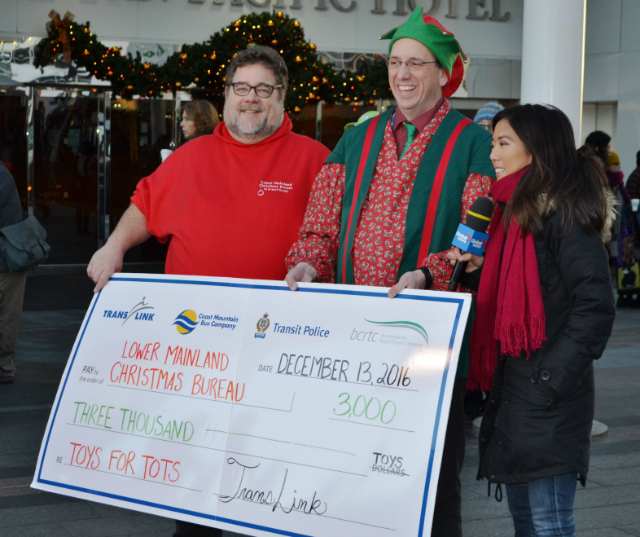 Delivering our promissory note of 3,000 toys to the Lower Mainland Christmas Bureau! It was a unseasonably chilly morning when Sparky the Elf promised 3,000 new, unwrapped toys on behalf of TransLink and its operating companies to the Lower Mainland Christmas Bureau (LMCB), but the air was filled with warm, holiday cheer! 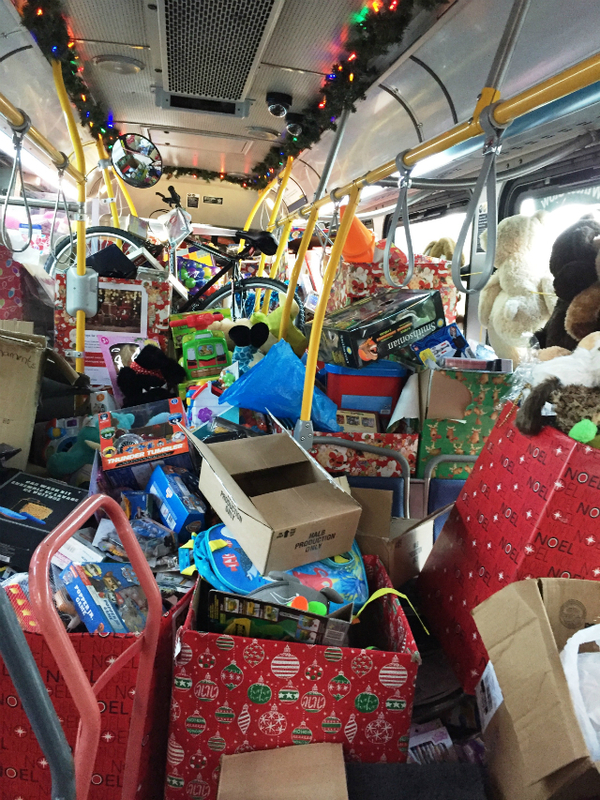 Toys for Tots in our region was developed by a group of BC Transit operators back in 1985. Each year since, the employees of the TransLink enterprise have donated to the less fortunate during the holiday season. Donations have been made at all eight transit centres, TransLink Lost Property as well as HQs for TransLink, CMBC, BCRTC and Transit Police. How do we deliver these packages of Christmas joy to the LMCB? By reindeer bus and shuttle, of course! Santa, Mrs Claus, Sparky, Prancer (that’s me) and some plucky helpers collected 6,111 toys and items from across the Enterprise! That is on top of over $500 of cash donations! This year is record-breaking and it wouldn’t have been possible without the immense generosity from all of our staff to make this season a little brighter for those in need. A “defuser” may sound like an electronic device but in the context of Coast Mountain Bus Company, it means something much more personal and important. A CMBC defuser provides what they like to call “emotional first aid” to employees out on the road; they help operators better cope with serious incidents. . When the volunteers of this program are called, it’s because a driver is in need of help due to a major accident, a passenger assault or even a death. The internationally accredited program began in 1992 and is very similar to the same resources extended to police and fire service employees after a traumatic event. Statistics show that people who get “defusing” shortly after an incident have a much better recovery rate. Dave McKay has been in this vital support position for 15 years and now acts as the program’s coordinator. He says they try and get a defuser out to an operator in need within hours of an incident. All defusers are volunteers and initially were only operators but now the positions are open transit employees, including some former mental health workers. McKay says a defuser needs empathy, listening and people skills and be able to do well in a crisis. The incidents can be very traumatic for operators and defusers are on call during all service hours. And it’s not only the operators that need some support. Due to its stressful nature, all defusers have sessions themselves after responding to 10 incidents. A defuser may not be a well-known position outside of CMBC but it is a job that makes such a difference in the lives of operators and employees and helps us keep you moving across the transit network.